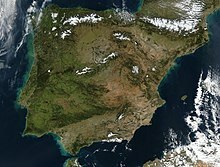 The Iberian Peninsula, or Iberia, is the southwest part of Europe. Like all peninsulas, it is mostly surrounded by sea. To the south and east of the peninsula is the Mediterranean Sea. To its north and west is the Atlantic Ocean. It is the third largest peninsula of Europe with an area of 582,860 km². The name Iberia is the Ancient Greek name for the area which the Romans called "Hispania". The word Hispania is now used for Spain, while the word Iberia is used for the whole area. The word Iberia was also used by the Ancient Greeks and Romans for another territory at the opposite side of Europe - Caucasian Iberia which is near the Black Sea. This page was last changed on 1 November 2018, at 21:07.